The first prompt you see will likely look like the one to the left. It will ask you if you wish to Save the file to your computer or Open it from its current location. 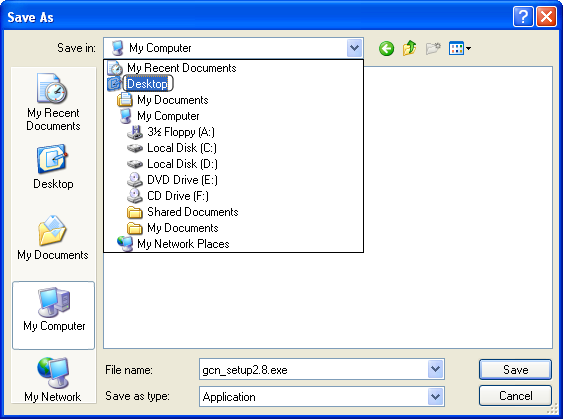 We recommend that you save the file in a location that is easy for you to find, such as the Desktop. If you choose to Save the file you will get a prompt that looks like the one below. Once you have chosen a location to save the file, the download will begin. After several minutes, or seconds depending on the speed of your connection, the download will complete. Before the download finishes we recommend that you Uncheck the box that says "Close this dialog box when the download completes". This will allow you to click the 'Open' button when the download finishes, and automatically begin the Installation process. If you see this window, then congratulations! 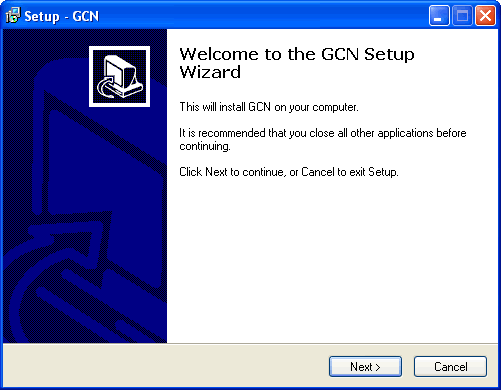 You are now ready to begin installing GCN. Simply follow the on-screen instructions, and proceed by clicking 'Next'. 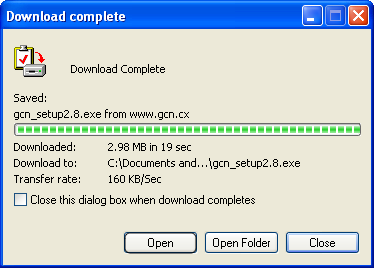 After the installation finishes you will be given the option of launching GCN. The first thing you must do after opening GCN is register a Screen Name by clicking the 'Register' button. If you have any difficulties getting GCN installed or working on your system, don't hesitate to contact us via our Online Support system, and we will get back to you as soon as possible.